The Lawn Fawn Blog has a challenge for World Card Making Day to make a thank you card using their stamps and to send it to someone. The Lawnscaping Blog also has a challenge which is to make a card of any theme using Lawn Fawn Stamps. I am going to put this one in both. This is so cute! I LOVE that you used the black card stock. I don't know why, but I never think of using black except at Halloween. Dumb because your card is awesome. You scene really pops against that dark background and I love the penguin critter holding the sign! This is precious. Entirely too cute!!! So creative & fun!! This is super cute! What a great design too -- with a little chipboard I think it would make a great detachable ornament. 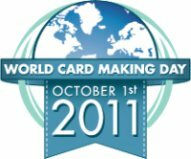 Thank you so much for participating in our World Card Making Day Challenge! We just love your card! It is so cute! Just love this penguin scene! This is adorable! So creative...love it! This is fabulous! I love everything about this...the window, the black card stock, your snowy sky.